The new facility for the University’s Rocking Horse Nursery showcases the organisation’s commitment to providing a family-friendly campus community, while at the same time demonstrating leadership in sustainable and environmentally-friendly new infrastructure. The £2 million newly-completed building will be the first fully certified Passivhaus (Passive House) building in a Scottish university, and the first pre-school facility in Scotland to adopt this demanding energy-efficient design concept. The Passivhaus design provides a high level of comfort for users, while consuming very little energy for heating or cooling. 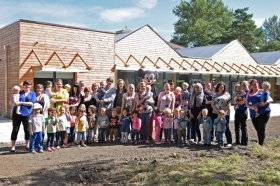 The Rocking Horse Nursery is expected to be the first building in Scotland to achieve the combination of Passivhaus accreditation and be awarded ‘Excellent’ in the BREEAM industry-standard ratings scheme.BREEAM is the world's foremost environmental assessment method and rating system for sustainable buildings. The nursery in the Powis Gate area off College Bounds will be a safe, nurturing and environmentally-conscious setting in which the youngest members of the University community can learn and have fun, indoors and outdoors. The building will be surrounded by landscaping, and excellent opportunities for outdoor activity, including a walled garden for the children to explore and enjoy. The building will cater for 78 children (the former nursery catered for 47) from small babies to five year olds. This increase in capacity will enable greater numbers of students and staff to benefit from first-rate childcare at the heart of the campus. The children reflect the growing international diversity of the University community, with over twenty different nationalities represented. For BMJ Architects and Burns Construction (Aberdeen), the University’s Passivhaus project has provided valuable expertise in what is now the fastest growing energy performance standard in the world, with 30,000 buildings constructed to this design to date, the majority since the year 2000. The original Rocking Horse Nursery was established in 1989 and has provided a caring, nurturing environment for the children of University staff and students ever since. 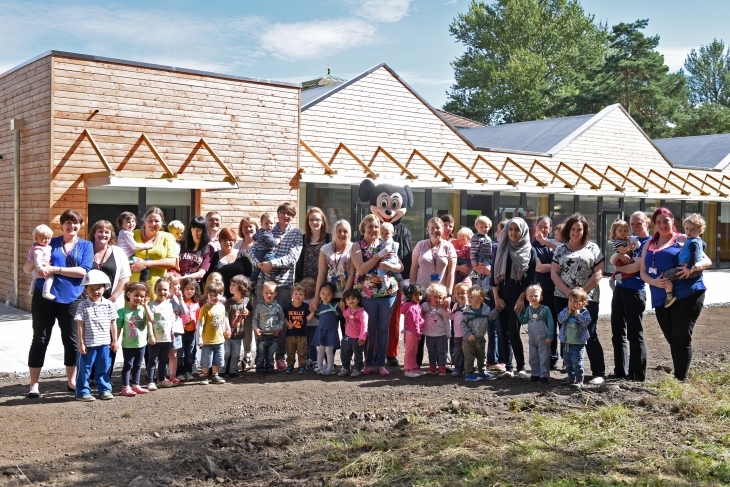 The Nursery is registered with the Care Inspectorate and is established as a Trust and run on a not-for-profit basis by a Board of Trustees comprising staff and students. Every component and material has been assessed for its potential impact on the calculations that underpin the Passivhaus design. Tape/Glue: as part of the air-tightness regime, the Nursery used 5010 metres of specialist tape. The glue on the tape is also used on aircraft wings and has a 60 year guarantee. Insulation: good insulation is key to the Passivhaus concept. The Nursery foundations are surrounded by 120mm of insulation, with a further 300mm under the floor. The structure itself has 295 mm of insulation in the walls and 420mm in the roof. Piling: the Nursery is built on 43 concrete piles with an average depth of 24m. Workmanship: attention to every detail in the construction is vital to maintain envelope integrity, minimize cold bridging and to limit air ingress. Skylights: the Fakro skylights are quadruple-glazed and designed to allow solar gain but also to reduce heat loss. They are electrically operated to allow easy opening, with blinds to reduce solar gain when necessary. Windows: the Internorm windows are triple-glazed with insulated frames and spacers and optimized installation. They reduce heat loss but also improve the comfort levels within the building. Air Tightness: a key part of the Passivhaus design is a high-level of air tightness. The Nursery achieved an unprecedented score of 0.475 ACH (Air Changes per Hour) against a target score of 0.6 ACH. Heating: the building is designed to use minimal energy through the design of the internal fabric. Heat will be provided by solar gain, heat radiated from the occupants and internal equipment (eg IT). An integrated Mechanical Ventilation and Heat Recovery (MVHR) unit will work alongside Air-Source Heat Pumps to recover internal heat and pre-heat incoming air to reduce the amount of energy required. This recycling of heat will help to maintain a constant, comfortable temperature. The building is designed to function without a heating system. Underfloor heating has been installed but should be used only in extreme cold weather. Sustainability: other sustainability features include grey-water harvesting for toilet flushing, solar panels to heat water, and LED lighting throughout.